Custom made bedding is our specialty. A custom made bed will provide you with years of comfort and quality sleep. Offering great value for money, a custom made mattress and bed is tailored to meet your unique requirements. Why accept a bed that will make you feel uncomfortable when you can have a bed of your choice? We will make a custom made bed to suit you! We have over 70 years experience in building high quality custom beds. We combine exceptional craftsmanship with a commitment to quality service. Our beds are made right here in Australia from locally sourced materials and components. 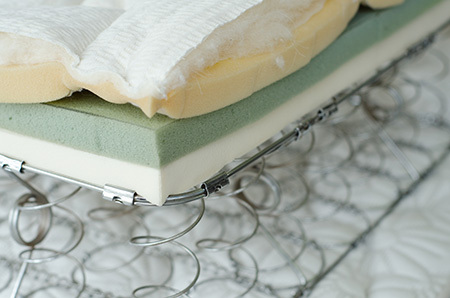 Because we manufacture our own mattresses locally, we can custom make a mattress to any size. Whether you have an antique bed, European size or American king we can custom make it to your measurements. Once we have made your bed, we will deliver it to your doorstep and remove your old mattress. Innerspring is a standard and traditional type of construction for mattresses, consisting of a system of interlinked springs. Pocket Spring mattresses are constructed from individual metal springs being sewn into individual fabric pockets. Latex is a white liquid extracted from rubber trees. Natural latex is dust mite, mildew and mould resistant. Memory Foam, invented by NASA, molds to the body in response to heat and pressure. It is commonly made from polyurethane. We can custom make a bed to fit any dimension or size requirements. Below is a list of standard sizes and dimensions.